Big thanks to Mum for spending these few days sewing with me – we've got through an amazing amount. It was Friday we finished the main part of the quilt top (even though it only got posted yesterday). We sewed from dawn to dusk. At 6pm we were due to catch a bus for dinner in Newtown and the last bit was sewn on at twenty to six. So there wasn't really time to take a pic. Once it was all laid out there were a few squares that weren't quite right because of what they were sitting next to, or a concentration of the same fabric close by, so there was some unpicking and re-sewing to get it right. 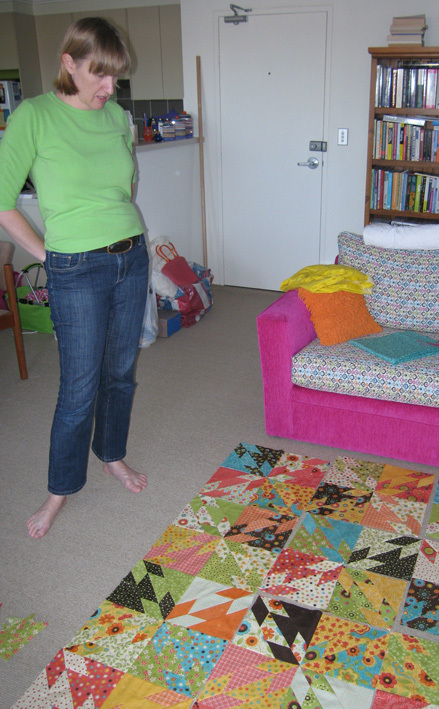 To be fair, I did spend a bit of the day staring at the quilt as per the pic, making sure all the combinations looked good. Most of yesterday was spent in fabric shops. We got the wadding, both the backs and the small cream border. I wasn't confident we'd get it all, but we mostly found it all in one shop. Perfect! There's been much um-ing and ah-ing over the last few days about the back of the doona – the part I was going to get you to do Sandra. I asked Kate how you did hers and she said it was with one piece of fabric, which I think is probably best. Even though we've got left over fabric, I'm worried that if we piece something it will come undone because it won't have the advantage of being held together by quilting or finished off as you would normal sewing. 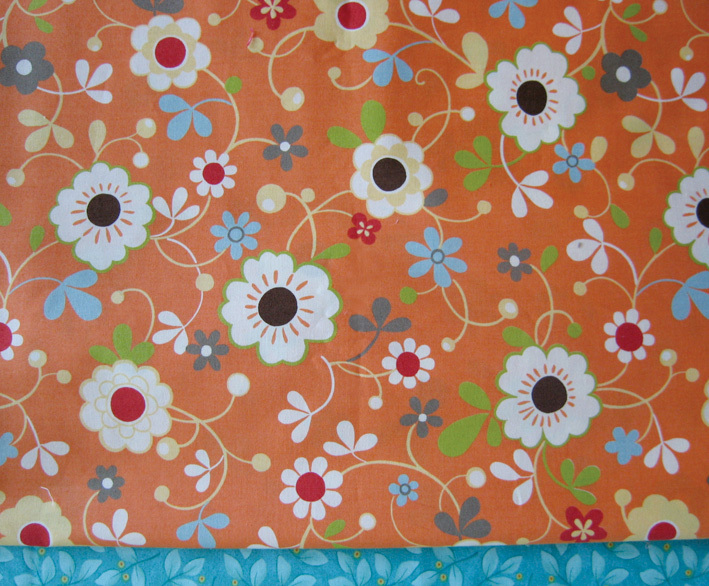 Anyway, we found a fabric that is also by Moda, not the same design, but almost exactly the same colourway and bought it for the back. I think it will be easier all round and there'll be no risk of it coming undone. Oh and good luck going back to work Tara! it is absolutely stunning! Love it. Well done TJ and Meri (and Shireen too). Awesome job guys. Did you have trouble with my squares? Hi Jode, there were two where you'd sewn them back to front. Kate did the same thing – I think there was one triangle she did it three times on and had to keep unpicking! Otherwise there were just the usual things of everyone's being consistent size but slightly different to everyone else's – it's just the joy of collaborative quilting! – oh and of course, me changing my mind with some of the colours. So there was some stretching and some cheating, but it all came good in the end. 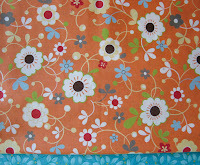 Agree that the backing fabric is fantastic and even better that I don't need to sew it. Loved having the "Kiddies" for the weekend BUT I was hanging out for Stace and Drew to get home Sunday night. 4 is exhausting I can tell you, thank goodness I had your Dad to help Kate. Oh and Shireen, just loved your "Guest Appearance"As usual your comments bring a smile to my face and I loved what you thought could go on the back of the quilt all be it a bit long to have embroided I think.